Negley deploys the 78th Pennsylvania at a gap in the road to cover the withdrawal of his force. 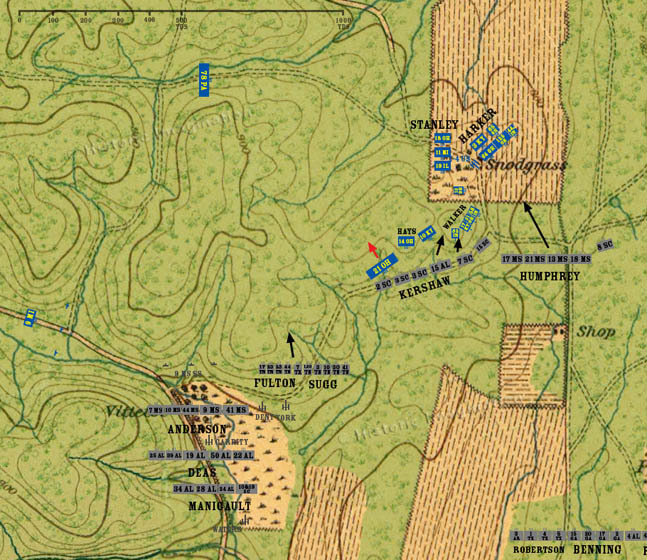 The 21st Ohio is repulsed from its counterattack, and treats back up to the crest of Hill Three. Johnson’s Division moves to a position where it can launch its attack against Horseshoe Ridge. Hindman’s Division arrives at the Vittetoe farm. The 15th Alabama inserts itself into Kershaw’s line between the 3rd and 7th South Carolina. The commanding officer of the 15th, Colonel William Oates, attempts to order the brigade to attack without Kershaw’s knowledge or permission. The 7th South Carolina joins the 15th on a charge up the ridge. Humphrey moves his brigade forward to the edge of the cornfield at the base of Snodgrass spur.